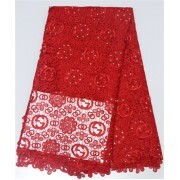 Get fabrics for women and men at GbanjoDeals as various materials are suitable for aso-ebi in parties or ceremonies. Explore our amazing collection of Ankara fabrics online, cord laces, raw silk, batik, voils, butter lace, woodin fabrics, brocade, silk, saree, plain and pattern; Carefully choose the style that will add a touch of elegance and class to your overall appearance for occasions you attend. Fabrics are ideal for both youths and adults to be fashionable and trendy when going for social events as materials like Ankara come in exquisite colours and designs that will let you make a stunning fashion statement. Make glamorous styles with luxurious cord lace material in Nigeria as well as Ankara fabrics and you can pair them with other beautiful accessories for that upcoming white wedding or traditional wedding ceremony. Nigerian fabrics on GbanjoDeals! are of extremely high quality.